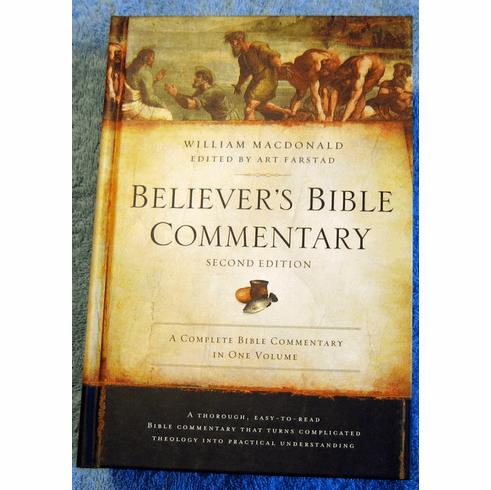 Get your copy Believer's Bible Commentary by William MacDonald. Use with any Bible translation. Complete Bible Commentary in one volume! : Thorough, yet easy-to-read Bible Commentary that turns complicated theology into practical understanding. More than 2400 pages. Make Bible study a part of your daily life with the thorough, yet easy-to-use, Believer's Bible Commentary. William MacDonald tackles the controversial issues head-on, taking a theologically conservative stand, yet presenting alternate views with fairness. The Believer's Bible Commentary is a friendly guide to exploring the deeper meanings of every biblical book. This new edition includes 14 pages of 4-color maps of the Holy Land and other study helps. William MacDonald is best remembered as the longtime president of Emmaus Bible College, teacher, Plymouth Brethren theologian and a prolific author of more than 84 books. Born in Massachusetts in 1917, MacDonald graduated from Tufts College in 1938 and received an MBA from Harvard Business School in 1940. He worked as a bank investment analyst, then served in the Navy. After World War II he joined the faculty of Emmaus Bible College, becoming president in 1959. Leaving the college in 1965, he led a global Bible teaching ministry and served on the faculty of Discipleship Intern Training Program from 1973 until 1996. He remained in Bible teaching ministry until his death in December of 2007. Buy the Believer's Bible Commentary by William MacDonald the One Volume edition at wholesale, sale and discount prices.